This form is a separate lease for the furniture, equipment and personal property in existing offices subleased by the original tenant to a subtenant. A. Landlord currently leases that certain office building located at ____________________ (the "Building") pursuant to the terms of a lease with ______________ ("Master Lease"). B. Landlord and Tenant are entering into that certain Sublease of even date herewith (the "Sublease") pursuant to which Landlord will sublet the Building to Tenant for an initial term of five (5) years, subject to certain renewal and cancellation rights set forth therein. In addition to subletting the Building from Landlord, Tenant desires to lease from Landlord certain furniture, equipment and furnishings owned or leased by Landlord and presently located in the Building, and Landlord is willing to lease the same to Tenant on the terms, covenants and conditions hereinafter set forth. 1. LEASE. Landlord agrees to lease to Tenant and Tenant agrees to lease from Landlord, subject to the terms, covenants and conditions herein, the items of furniture, equipment, furnishings and other personal property described in Exhibit A attached hereto and incorporated herein by this reference (the "Furniture"). Landlord being the owner of the Furniture for all purposes, this Lease is intended to constitute a true lease of the Furniture and not an agreement for the sale of or the grant of a security interest in any Furniture. 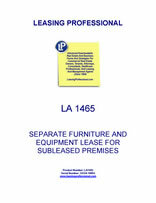 Tenant's interest in the Furniture is limited to a leasehold. 2. TERM. The term of this Lease shall commence upon the commencement date of the term of the Sublease referred to above and, unless earlier terminated as provided herein, shall continue for so long as the Sublease shall remain in effect. Upon the commencement of the term of this Lease, Landlord and Tenant shall conduct an inspection of the Building in order to identify and inventory the Furniture and verify its then current condition. 3. RENT. Tenant shall pay to Landlord rent for the Furniture in the amount of $___________ per month. Tenant shall commence payment of such monthly rent on the commencement date of the term of the Sublease, which date shall be ________________, unless otherwise determined, notwithstanding any earlier commencement of the term of this Lease. The parties understand and acknowledge that the rent figure set forth above is an estimate by Landlord of the rent to be payable hereunder, based upon Landlord's preliminary estimate of the initial cost of the Furniture and the amortization of such cost over the term of this Lease, and that Landlord shall not know the actual initial cost of the Furniture until after the date of commencement of the term. Accordingly, Landlord shall have the right, within six (6) months following the date of commencement of the term of this Lease, to deliver notice to Tenant setting forth a revised monthly rent figure payable hereunder, together with reasonable back-up documentation supporting the calculation of such rent figure. If such monthly rental amount is in excess of the amount stated above, Tenant shall deliver to Landlord a reconciliation payment of any underpayment within thirty (30) days following Landlord's delivery of such statement; correspondingly, if such figure is less than the monthly rental figure set forth above, Landlord shall credit any overpayments by Tenant against Tenant's next-due payment (s) of rent hereunder. Such monthly rent shall be payable in advance on the first day of each calendar month during the term hereof, in lawful money of the United States (via wire transfer or other method mutually acceptable to Landlord and Tenant), to Landlord at its offices at ________________________________, or to such other person or at such other place as Landlord may from time to time designate in writing. All rent and other amounts payable hereunder shall be due and payable without any offset, deduction, prior notice or demand and without any abatement, reduction, counterclaim or other right Tenant may claim against Landlord. 4. CONDITION OF FURNITURE. Upon the commencement of the term of this Lease, Landlord shall deliver the Furniture to Tenant in good order and repair, subject to normal wear and tear. Tenant acknowledges that Landlord is not a seller under the applicable provisions of the Uniform Commercial Code and that Landlord makes no warranties of any nature, including, but not limited to, warranties as to the merchantability of the Furniture, its fitness for any particular purpose, its installation, its size, design, capacity or condition, its quality, its compliance with any law, rule, specification or contract or latent defects. 5. LOCATION; LANDLORD’S INSPECTIONS; LABELS. All of the Furniture shall remain at the Building and shall not be removed therefrom for any reason whatsoever without Landlord's prior written consent. Landlord shall have the right to enter the Building and inspect the Furniture at any time during normal business hours and upon reasonable advance notice given to Tenant. If Landlord supplies Tenant with labels stating that the Furniture or any item thereof is owned by Landlord (or by a primary lessor), Tenant shall affix and keep the same on each item of Furniture, Tenant shall not alter, deface or remove any of the same and Tenant shall promptly replace any such labels that may be removed, defaced or destroyed. Tenant shall not permit the name of any person other than Landlord (or any primary lessor identified to Tenant) to be placed on any item of Furniture in a manner that might be interpreted as a claim of any right, title or interest in or to such item.